Please contact Steve & Eleanor Whitney with questions, requests, or suggestions. Veggie Clock is a clock app with an alarm and timer. There are hundreds (1000’s?) of clock apps with timers, but this one is unique. Veggie Clock’s time is formed by 15 different vegetables (made from real photos) that drop down from above and move into place when you start the app. Then the clock re-forms every time the minute changes. The app’s appeal is that it’s cute and fun the veggies react when you tap or drag them by moving and making sounds. It’s an especially good fit for moms and health-conscious people. Whenever I show it to people, everyone (kids and adults) wants to play with it. I hope you’ll check out the video and try it. We have a video that looks a bit like a 80’s TV ad (designed primarily for moms with young children) – it might be a fun video to embed in a blog. There’s also a walkthrough video that will probably be more helpful for you to decide if you want to take the time to download it. The walkthrough shows the “Christmas mode,” which might also be good for blogging this week. Veggie Clock looks good in the kitchen, office or bedroom so we added an option to keep the screen on when the app is running. And – no joking – our oldest son actually said that having it on made him want to eat vegetables! 1) Moms: Veggie Clock lets kids take responsibility for timing their tasks or getting up in the morning. Possible article/post ideas: Veggie Clock could be perfect for an “Apps to Get Moms for Christmas” feature if you’re planning one. Or a “ways to help kids grow and be less frustrated” post. 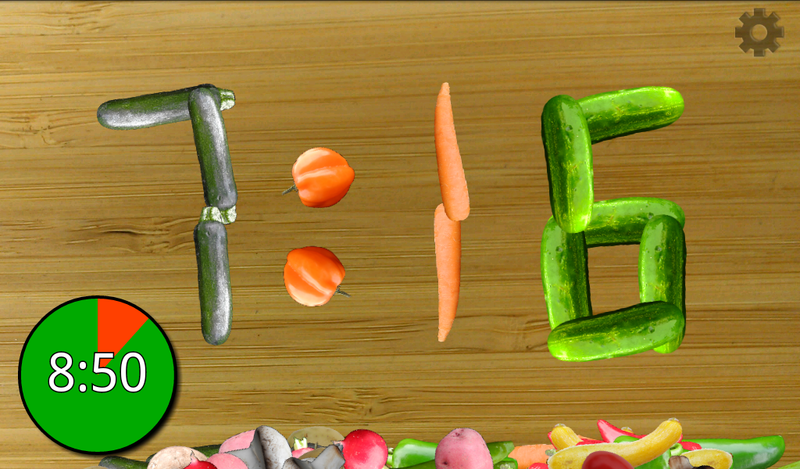 2) “Green,” health-conscious, vegetarian app users: We’ve found that Veggie Clock makes our kids want more vegetables. We use the phrase “making friends with veggies” Possible article/post ideas: Could be part of a “start the new year off right” or “10 apps to help you be healthy in 2013” post. 3) People who like “cool” or unique apps: Veggie Clock started as an art project. It’s HD (with enough pixels for super-high-resolution Nexus 10). For Android sites: it’s not available on iPhone or iPad yet so it gives Android fans bragging rights. Veggie Clock definitely gets people’s attention. (It’s not another beside digital clock or analog wall clock/watch face variation.) Veggie Clock is new and different (and not possible in the physical world J). Possible article/post ideas: Could be part of a post like “5 apps that are really different” or “creative and different apps” or for Android sites: “10 Android-exclusive apps” post. Version 1.1 has a “Christmas mode” with a Christmas tree background. Some of the veggies change into ornaments or get decorated. 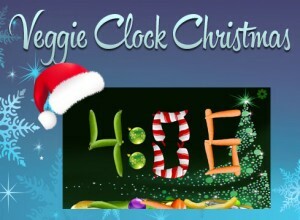 That makes Veggie Clock good for an “Apps for Christmas” or “Holiday Apps” post. On the “more options” screen, we called it “display seasonal decorations” so we can use the same switch for future “seasonal” additions like Valentine’s Day or Halloween. Veggie Clock is available for the launch price of 99 cents (full price $1.99) for Android phones and tablets on Google Play, Amazon Appstore, and NOOK Apps. We’re working on an iPhone/iPad version for early 2013. Version 1.1 (with Christmas mode) is available now on Google Play. The other two stores still have version 1.0, but the new version should be approved and live on the other two stores within a week. For tech press or bloggers only: If you want to download Veggie Clock for a potential review/mention, we’ll refund your purchase price on Google Play. Just email us at and let us know the name you bought it under. We can buy you a gift card to get the app on Amazon Appstore or NOOK Apps if you’d prefer to review it on those platforms. Just let us know and we’ll send that to you. There are screenshots available on http://www.VeggieClockApp.com or if you need something different we can provide you with it. WhitneyApps is an “indie” app maker, where the whole family gets involved. 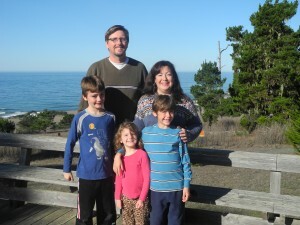 Steve & Eleanor Whitney plus our three kids all participate in app building and testing. (The veggie voices belong to our family – us and the kids.) Our aim is to make apps to help children and adults feel positive, joyful, and well-equipped for life. Life’s too short for boring apps! We make Veggie Clock, the popular CardDroid Math Flash Cards (74,000 sold as of November 2012), and a number of other apps – with more on the way. You can find out more about us at www.WhitneyApps.com.